The East Basin is an isolated 5 acre parcel at the far east edge of Pleasant Valley Conservancy, mostly down a fairly steep hill from the Ridge Prairie. Because of its location and its difficult access it was passed over when the rest of the Conservancy was restored. Work there did not fit in well with that of the rest of the restoration work in the Conservancy. Indeed, it was an easy site to overlook. 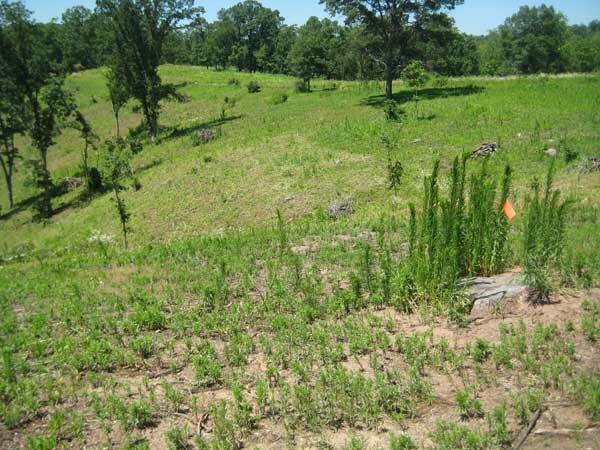 It was only when we began restoration on the adjacent Ridge Prairie that we even paid any attention to the East Basin. At the time of the 1937 air photo, the East Basin was completely open, with essentially no trees or other woody vegetation. Because it faces south and southwest, it seemed reasonable that it might have been a prairie remnant, even though the slope is not nearly as steep as the main south-facing hill. By the time we started work, the site was completely wooded, with lots of brush understory, and an aspen clone of about 100 trees. An extensive narrative of the East Basin work has been prepared (PDF) and can be sent by email attachment. Send an email request for file East Basin version 5.pdf to pvc@PleasantValleyConservancy.org. Note that this is a large file (81 MB). Although most of the work on the clearing and planting the East Basin was funded privately by Savanna Oak Foundation, Inc., there has been some grant support. 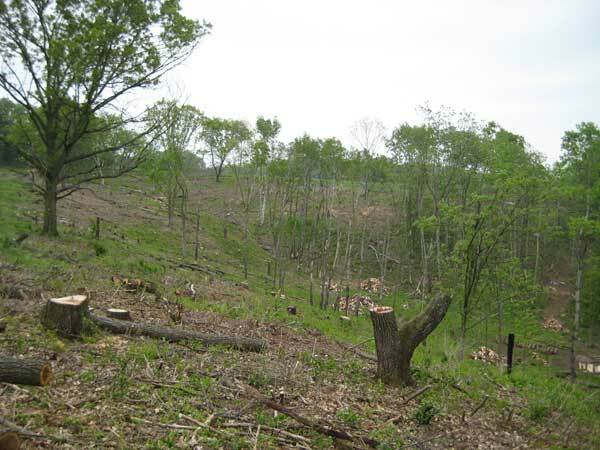 A small grant from the Landowner’s Incentive Program (administered by the Wisconsin DNR) support in part woody plant removal. A grant from the Wildlife Habitat Incentive Program of the U.S.D.A. 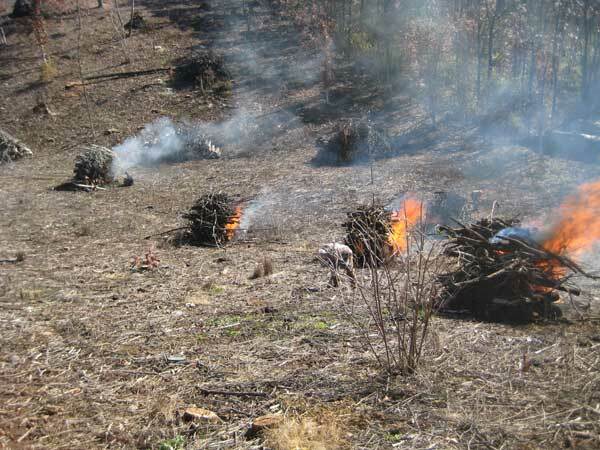 (NRCS) supported herbaceous weed control, burns, and planting. Clearing of the large trees began in December 2007 and extended into January 2008. This was a fairly large snow year so most of the stumps were cut tall and had to be recut in the summer. The members of the logging crew were experienced restoration ecologists and were careful to avoid any damage to the site. To prevent resprouting, all trunks were treated with herbicide (triclopyr). 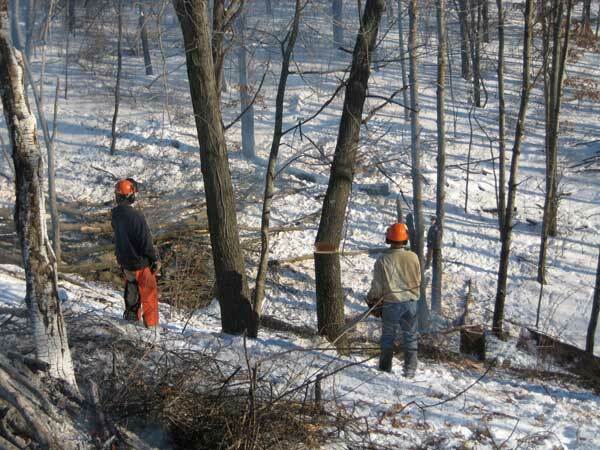 Two or three of the crew operated chainsaws and two or three others dragged the brush and small logs to burn piles. Tree species being removed incuded elm, cherry, box elder, black oak, aspen, and black walnut. Most of the cut trees were removed for fire wood, although a significant amount of trees of saw-log quality were transported to sawmills. Also, a neighbor moved in a small saw mill and turned the largest black walnuts into lumber. Photo above. Looking south down the East Basin. The double-arrow line shows the approximate property boundary. 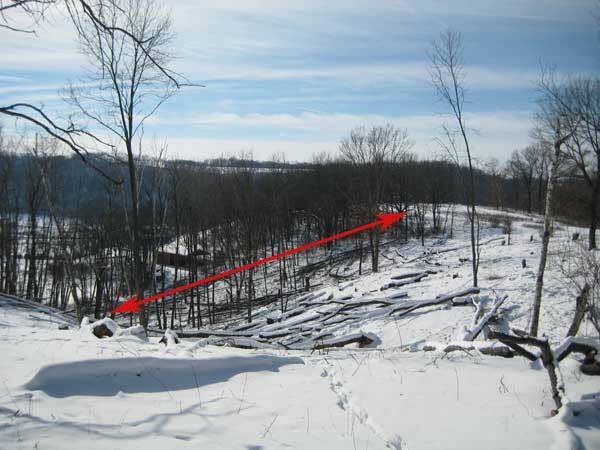 The wooded area between the property boundary and the open area in front gives an idea of the density of woods before clearing. Photo above. An early spring view (2008) of the East Basin the year after initial clearing. The remaining trees were aspens that had been girdled but were not cut until the following year when they were dead. In addition to good plants, there were many “bad” plants, including scattered brambles, honeysuckles, and a few small buckthorns. Past experience had shown that once an area had been opened up and sunlight was available, these invaders (and others!) thrive. Therefore, we decided to eradicate them now, while they were still small. For this purpose, we sprayed all of the undesirable resprouts or small plants with Garlon 3A. Our regular crew did this job, moving systematically across the East Basin and spraying every plant seen. In addition to the shrubs mentioned, the crew also sprayed any Canada goldenrod or Canada thistle, two invasive and very undesirable plants. 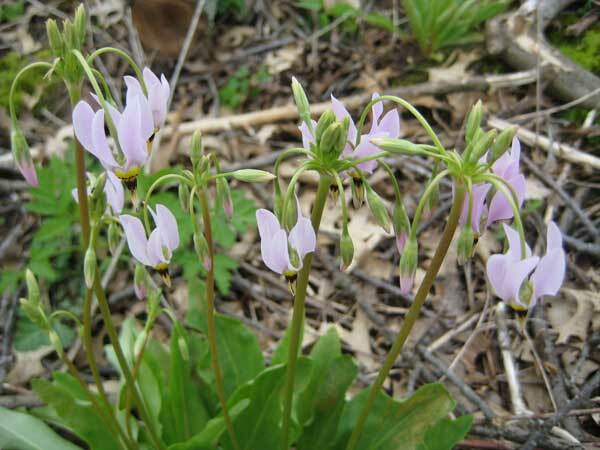 Several areas in the East Basin had substantial natural populations of shooting stars (Dodecatheon meadii). These areas were marked to ensure that these populations were protected. Also, special attention was given to these areas when the whole East Basin was planted to prairie. By mid-June 2009 the East Basin had become heavily colonized with undesirable vegetation. Although mostly annuals, there were also a number of perennials. Because of the steep terrain, a conventional boom sprayer could not be used. Therefore, the whole site was sprayed using a 300 foot hose. The spray rig consisted of a 100 gallon tank connected to an electrical pump and pressure-sensitive switch which kept the pressure constant. The herbicide was glyphosate. It took the operator about three days to spray the whole 5 acre site. The glyphosate spraying was very effective and within a week the results were starting to be visible. There were some areas of undesirable new growth that appeared after the spraying. These patches were spot sprayed in mid August 2009. Hand spraying the East Basin with glyphosate in June 2009. This photo gives an idea of the extent of the undesirable vegetation. Part of the aspen clone (girdled but not yet dead) is visible. The East Basin (right-hand part of the photo) about 6 weeks after glyphosate spraying. The remaining dead thatch was burned off in late Fall of 2009. 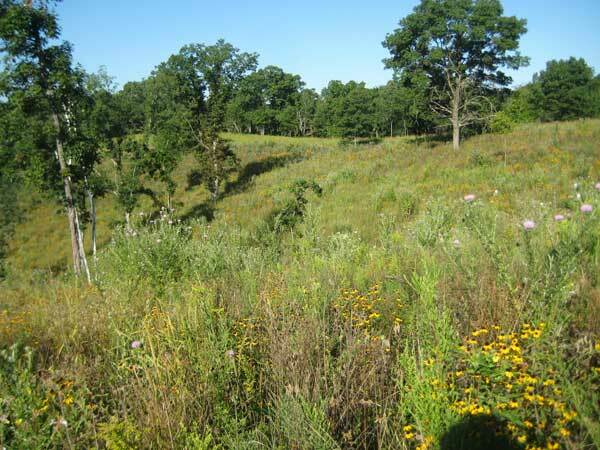 The site to the left is the Ridge Prairie, which had been planted in 2005 and was in its 4th growing season. Burning of the residual brush and logs, including the aspens that had been killed by girdling, October 2009. The great amount of work clearing the East Basin was finally finished in early November 2009 and it was time to plant. Because part of our work was being funded by the Wildlife Habitat Incentive Program (WHIP) of the U.S. Department of Agriculture, we had to follow their planting requirements as far as number of species and planting rate. Fortunately, these were minimum requirements and we far exceeded them. For two years we had been archiving seeds in preparation for this work. Most of the seeds collected in 2008 had been stored and were pooled with the seeds collected in 2009. Five acres is a fairly small prairie, but it still required quite a lot of seed. 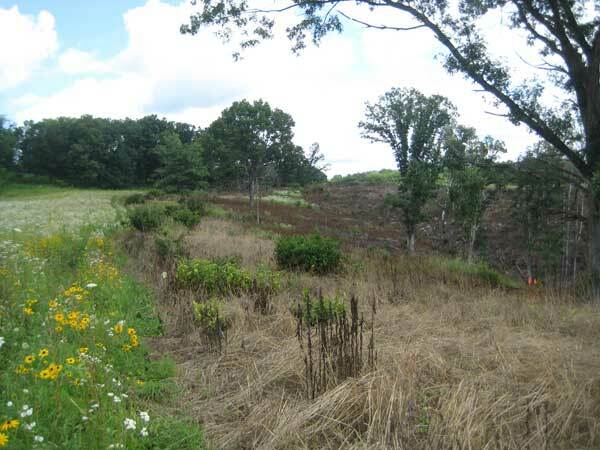 In fact, the 5-acre East Basin was the largest prairie we had planted at Pleasant Valley Conservancy. Planting the East Basin was not your ordinary prairie planting into former ag fields. This is hilly terrain with a rather complicated topography. Parts of the basin face east, parts south, and parts southwest. There is also an erosion gully in the middle, and an area at the bottom of the gully which is flat and has a wet mesic character. We spent a lot of time working out the planting schedule. There were three separate seed mixes, dry-mesic, mesic, and wet-mesic. 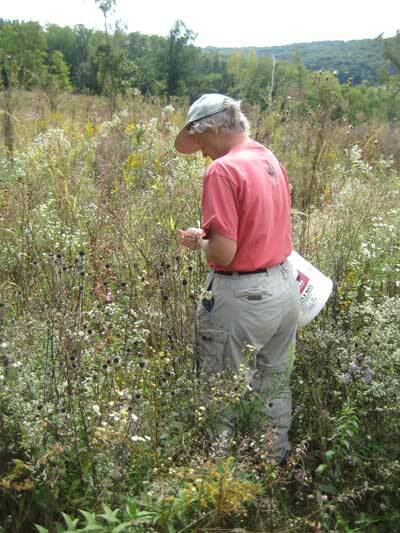 Each of the mixes had over 100 species of forbs. The dry mesic mix had lots of little bluestem and side oats, with smaller amounts of Indian grass. The mesic mix had more Indian grass plus other grasses that prefer wetter habitats, such as bluejoint grass. On the day of the planting (November 14, 2009) the weather was fortunately relatively warm and partly sunny. The Pleasant Valley Conservancy crew arrived early and distributed the buckets of seeds to the various planting units. Each unit had 2 or 3 buckets. At 10 AM the 18 volunteers arrived and we transported them to the top of the hill with our pickup truck. Most of the volunteers had planted a prairie before and were able to work expeditiously. Planting started at about 10:15 AM and finished at 11:45 AM. As expected, the first year the site was mostly annual weeds, which were mowed with a bush hog towed by a small Kubota tractor. With the steep hill, the residual rocks and stumps, and the scattered trees, the East Basin was tricky to mow. The whole job took several days (probably 6-8 hours total). 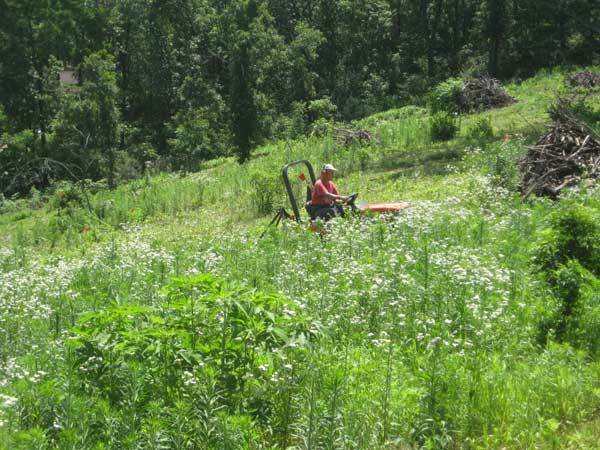 There were some steep areas that could not be mowed with the Kubota and were mowed by hand with a Stihl brushcutter. Mowing the East Basin in mid summer. The Kubota tractor pulling a small bush hog worked fairly well for this task. Obstacles such as big rocks or large stumps that had not been cut low enough were marked with flags and cut around. Because of the steepness of the hill, mowing had to be done in a vertical direction. Even with great precautions, there were still some dangers involved. General view after mowing. July 3, 2010. The tall plants in the foreground could not be mowed because of the large tree stump (visible in front of the plants). Note the areas of bare ground. Later in the summer, many more annuals developed on most of the bare areas. 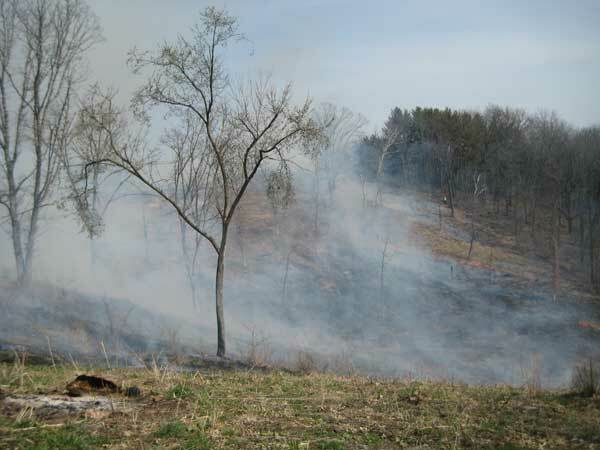 Because we had a grant from the Natural Resources Conservation Service for part of the East Basin restoration work, we were required to carry out a prescribed burn in early 2011. Although we had doubts about whether there would be enough fuel (since it had been mowed twice in 2010), we carried out the burn anyway. As it turned out, parts of the East Basin burned fairly well. The only concern with this burn was that the east side is next to our a neighbor’s land, which includes about 40 acres of highly flammable old-field pasture. We had to make sure that we did not set this field on fire. To keep things under control, a good fire break was mowed on the east side. We also had cleared a fire break along the south boundary of the property, next to another neighbor’s land. This break went down the hill to the bottom and up the other side. Because this line had been mowed well last year, the fuel was fairly low, so that control of the fire was no problem. 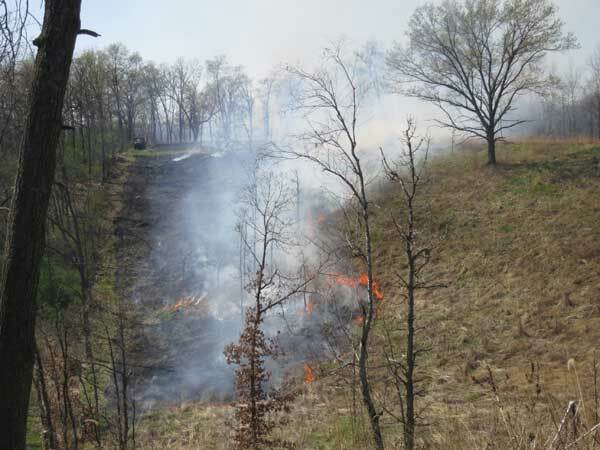 This burn was carried out with our regular crew of 5: We started burning a black line along the east side. Two people operated the pumper unit on the Kawasaki and the rest of the crew did the lighting. We took it slow until we had the east line fully black, and then did the rest of the burn. Everything went well and we were finished within about 2.5 hours. Burning the East Basin, April 2011. The burn was spotty because only certain areas had substantial fuel. Although there were plenty of weeds and rampant annuals the second year, the predominant species were native prairie plants. The principal invasive plant was sweet clover, and this was primarily localized in the upper part of the southeast corner. The sweet clover was hand-pulled by the PVC crew and by the summer interns. The interns also cruised the whole site and pulled weeds, mainly sweet clover. By mid-summer, the general aspect was of a lush, 2nd year prairie. This was the first time that one could begin to think that perhaps this whole restoration process might have been worth the time and money. In late March 2012 we carried out the second prescribed burn on the East Basin. The fuel was primarily prairie grasses and forbs that had done well during the 2nd growing season. We plan to burn the East Basin every year for an indefinite period of time. Photo above: East Basin burn, 29 March 2012. This burn was done by a crew of 5, two paid and three volunteers. The East Basin, early summer, 2011, during its second growing season. Although there were still plenty of flowering annuals, many perennials had become established, and the site was beginning to look like a prairie. The species list recorded during the 2nd growing season is given in the table below. 50 species are listed. Most of the observations were made along the upper end of the basin, either near the Ridge Prairie, or along the east border of the Conservancy. A few observations were made in the wet/mesic area at the south end of the site. In general, the success has been very gratifying, especially since site preparation was much more difficult than that of most planted prairies. 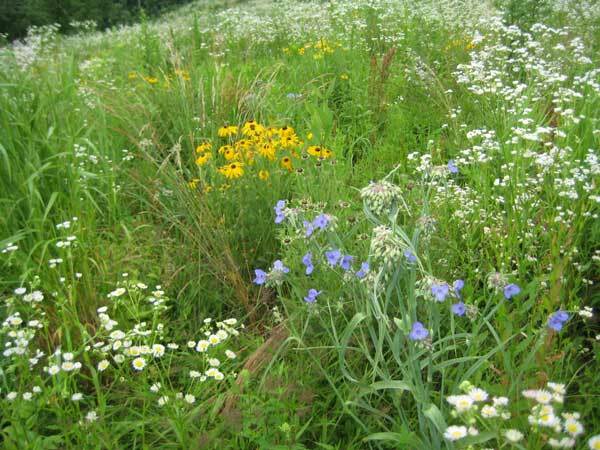 Finally, the site has been an excellent source for collecting certain species of seeds: prairie brome, pasture thistle, woodland and Virginia wild rye, June grass, and black-eyed and brown-eyed Susan. Long-term Management as a Savanna? Although we originally thought of the East Basin as prairie, it may be better to think of it as an open savanna. Why? •The crown cover in the East Basin is 13%, based on the number of trees per acre and the basal area per acre. This agrees with Curtis’ definition of savanna (greater than 1 tree per acre). •At its south end, the East Basin borders a neighbors wooded property, and shading from this woods creates a savanna habitat along a wide swath of the site. •There are scattered hazel shrubs, which are generally associated with savanna. •There are some herbaceous species that are considered “indicators” such as Elymus riparius which grew prolifically as a “volunteer”. •The NE corner of the East Basin already has savanna character. What does managing for savanna mean? 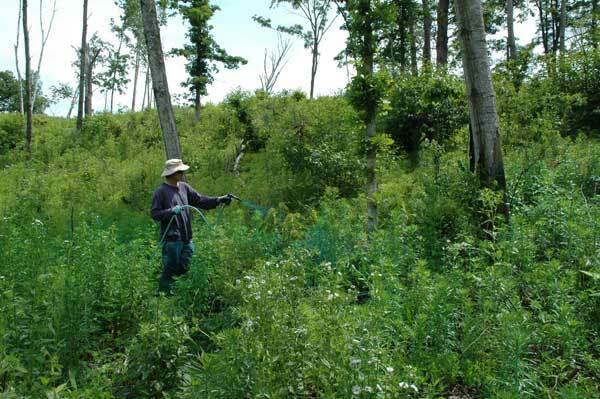 Burns, control of invasive species, and other management activities will be similar. The principal difference is that the remaining large trees in the East Basin will not be cut, and the smaller trees will be allowed to get larger. The photo below is a typical view of the East Basin in mid summer of its second growing season. The large oak at the top of the ridge has typical open-grown character. It was for this reason that this tree (and the other large trees) were not cut. The smaller oaks will also be allowed to remain, and to continue to grow as open-grown specimens. Why were these smaller trees not cut when all the others were? Time and money probably are responsible. There were so many large undesirable trees that had to be removed, that even the smaller oaks were allowed to remain. East Basin. The data here are derived from the contractor’s monthly invoices and the monthly time sheets submitted by Savanna Oak Foundation, Inc. employees. In addition, estimates were made of the hours put in by volunteers. The total is slightly over 3000 hours. Some hours likely have been missed, so that it seems reasonable to round this number up to 3200 hours. As the table shows, most of the work was for cutting trees and removal of wood and for seed collecting. Other tasks included in the total are relatively minor. The $16,000 per acre figure comes as a real shock. If we had this figure in mind at the beginning would we have started this project? Probably not, although it is gratifying to see the results.